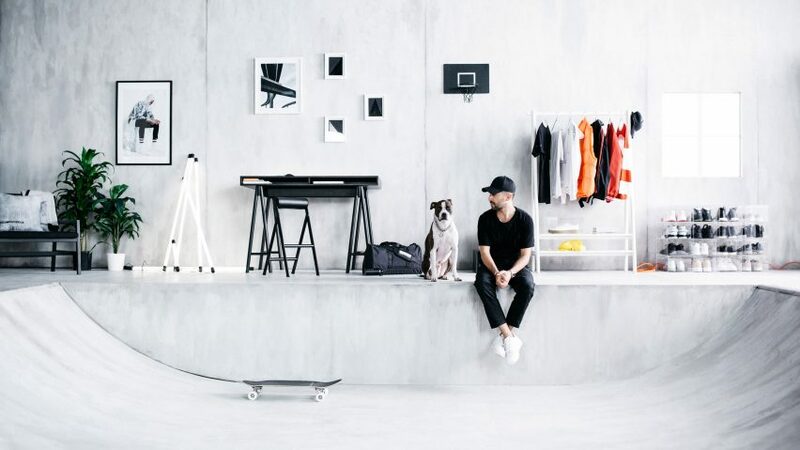 IKEA has launched its first skateboard, as part of a series of furniture and clothing items influenced by street culture in Southern California. The Spänst collection includes 32 limited-edition pieces created with Chris Stamp, a fashion designer and creative director of LA clothing brand Stampd, and Warsaw-based product designer Maja Ganszyniec. "I'm honoured to get the opportunity to design the first skateboard ever at IKEA," said Stamp. "I grew up surfing and skating. Here in So Cal, skating is more than transportation. It's a culture." Priced at $90 (£65), the Spänst skateboard has a birch plywood deck that measures 74 centimetres long and 21 centimetres wide. A splattered black and white graphics covers its underside, accompanied by steel and aluminium trucks, and white plastic wheels. Swedish company's new range also features monochromatic clothes and home accessories. The wearable items – all black – include a cap, hoodie and T-shirt. There is also a black duffle bag, towel, throw blanket and laundry bag in the collection. A transparent shoe box is made from acrylic plastic and designed to be stacked one next to the other to form a gridded piece of furniture. The Spänst shoe box will be sold for $35 (£25) a piece and is made to fit a variety of different sneakers. "As a fashion designer, I know that people want to show other people their clothes, shoes and accessories," said Stamp. "Why spend a lot on a pair of sneakers and hide them in the closet?" "I want them [the consumers] to be able to take pride in how they display their clothing and footwear, allowing them to appreciate their pieces just as much when they're not being worn," he added. The collection also includes wearable items, all black, such as a cap, hoodie and t-shirt. There is also a black duffle bag, towel, throw blanket and laundry bag in the collection. A wardrobe comprises an angular steel capsule with semi-transparent black mesh doors, which will cost $279 (£200). Another white-coloured clothes rack has two shelves at its base and will be sold for less, at $194 (£139). An LED light stick comes in two lengths and can be charged with a USB. The lights can be clipped onto the wall or leaned up against it to form a structural design. An all-black armchair, available for $272 (£195) has a low profile with cotton cushioning and a solid beech frame. Other more playful pieces of the collection are a black hoop and ball indoor basketball indoors, and a black stool that serves as standing support. A high-top black ash table top is supported on trestles and is designed for DJ turntables. "Since our first meeting in New York, our designs for the collection have been very coherent," said Ganszyniec. "It turned out Chris and I had very similar ideas for the collection and its aesthetics." "They were inspired by the sports industry and the conscious consumer – people who are not only concerned with what they wear, but also how to collect and show off those items – beautifying their surroundings in the process," said Ikea. The Spänst collection will be on sale from May 2018, and also includes pillows, a notebook, water bottle, other accessories. Continuously diversifying its range of products, IKEA also released its first speakers earlier this year. Recent collaborations with external designers have included Piet Hein Eek, Form Us With Love and Tom Dixon.